thePatientPotter: So How do you Clean Native Clay Anyway? The Mission: to explore, create and inspire! thePatientPotter is a blog that is designed to encourage and inspire fellow Potters and Entrepreneurs as it takes them through the challenges and triumphs of a 'potter on a mission'. So How do you Clean Native Clay Anyway? This is a question I get asked a lot. Let me show you the process I use and then at the end of this post I will include a link to someone else's process. The two different processes should give you a good idea of what needs to be done. 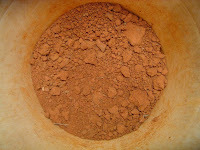 This is what my native clay looks like fresh off the pile my husband made. 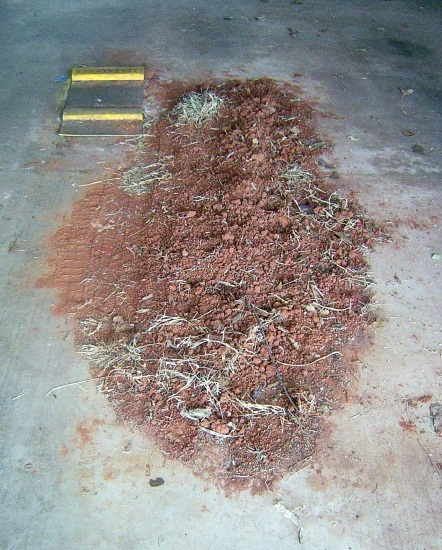 Besides your normal pebbles, sand, and impurities, I have crabgrass, bugs and anything else that might find itself on top of a pile of dirt outside. So What is the Process for Cleaning this Mess? 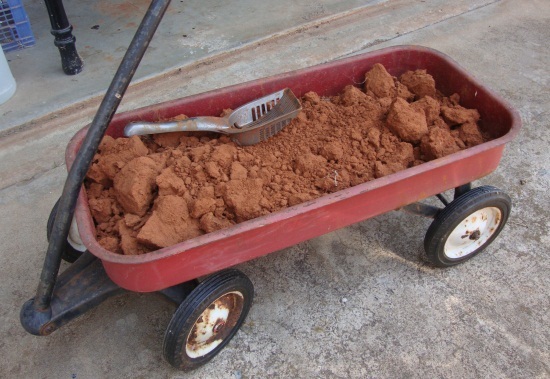 or, I keep it parked in the wagon I loaded up for a week or so, breaking up large clumps into smaller clumps as it dries, pulling out the weeds and large pieces of whatever. In another 5 gallon bucket I fill it half full with water and slowly pour the first bucket of dried clay into the second bucket of water. I do not stir the two together but instead let it settle on its own to slake for a few days. 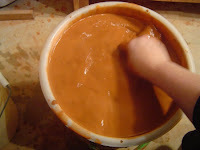 This is what the mixture will end up looking like; silky, sandy, pebbly, muddy, beautiful, slimy clay. 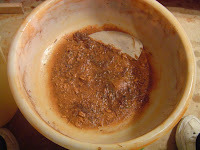 Sometimes this mixture can stink if it has a lot of organic material in it. 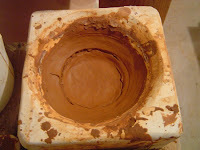 Even though the organic material will burn out in the kiln, you don’t want too much of it in your clay. Next, I take the first 5 gallon bucket, which is empty now, and put a 80 mesh sieve which is designed to sit on top of a 5 gallon bucket, then scoop in enough slaked clay to fill the screen about ¼ of the way. I fill up a smaller, regular bucket with clean water and set that next to this bucket. I grab a seat and settle in for some soul-searching cleaning time. 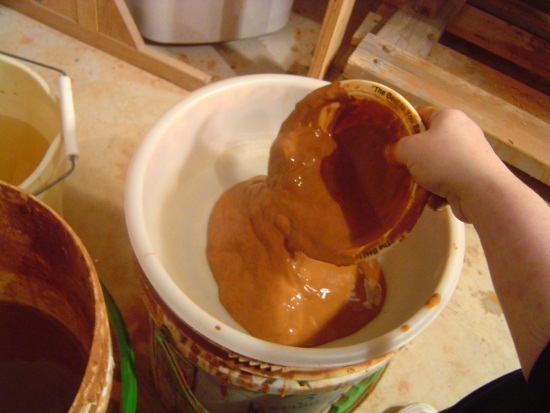 Add clean water to the slaked clay and take a rib and scrape the sand from the top of the screen back and forth, so the clay can be washed through the screen. Back and forth, back and forth adding clean water as it flows through the screen. 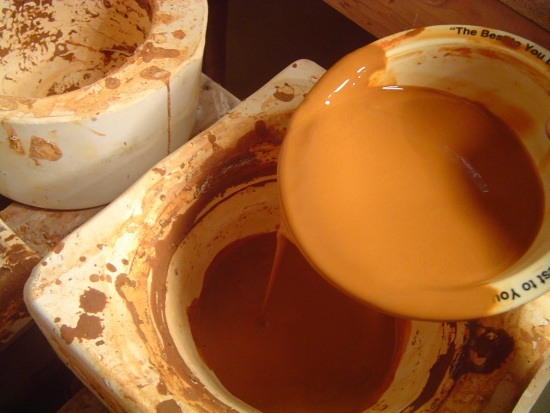 Keep adding clean water until you think all of the clay has been washed out. This is what I have left in my sieve when I am done washing. Sand, pebbles and debri. This I set aside to be used as grog on hand-built projects (I'll post about this later). 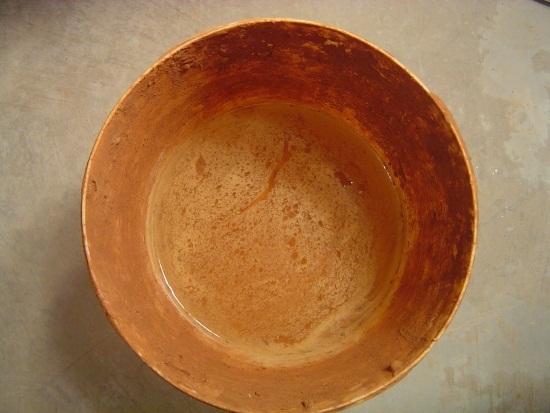 Let the washed clay set for several days so that the clay settles and the water becomes clear on top. Then pour that water back into the small bucket to be used next time. Pour off this water slowly so as not to disturb the settled clay. Stir up your clean clay and then pour into some plaster bats.The bats will remove the excess water and leave you with wonderful native clay. The bats will remove the excess water and leave you with wonderful native clay. 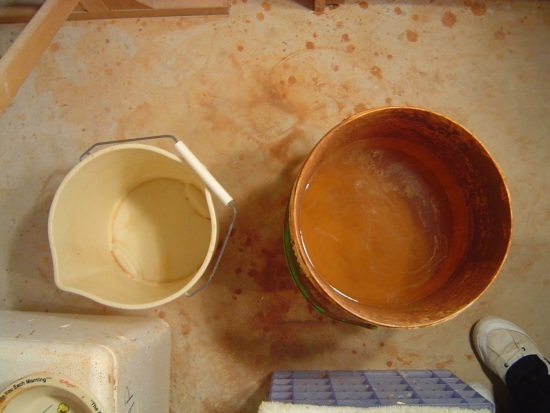 The only item I needed to purchase to wash my clay was the sieve. I had tried the window screen as others have mentioned but did not like using it. The screen I used also let too much sand pass through. I have a lot of sand in my clay so I spent some time researching trying to figure out what size mesh I should use to get the right amount of sand removal. I finally decided to try 3 sizes; 60, 80 and 100 mesh. The eighty works well for my needs. That's it. That's my process. I have each phase of this process going at any given time so that I always have clay available when I need it. Now here is the link to the other process that I promised you. Have fun! 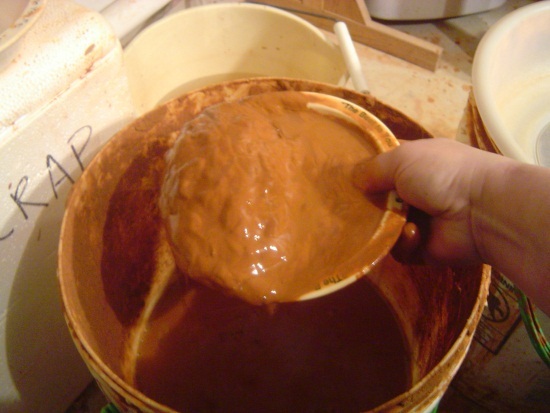 If you have a different process for cleaning your native clay, mind sharing? Wow, that is impressive! I admire at your skills! Keep up with the good work. Thanks! I actually find the whole process very soothing. I like reading post like this because it shows how much work really goes into handmade items such as yours. Some potters use clay they dig themselves, some buy their clay, some mix half and half, some mix their clay from chosen ingredients... to some potters their clay is a huge part of their process, a huge part of who they are as a potter (this is me). To some it's the glazing process and their glazes are the distinction of their pottery, others it's the form or function, etc... Next time you talk to a potter, quiz them on their clay, or glaze or form and see if you can figure out what process their passion comes from.